I know, I know. I’m supposed to be posting about the culmination of Sunday’s date in Rittenhouse Square. But I haven’t finished writing it yet. So here you go in the meantime: a little blast from the past (from 2010 to be exact). It’s my own fault. Having dated four perfectly lovely men and found myself rather enamored of three of them, you’d think I’d be content to leave it at that. But I’m only eleven days into my three month match.com subscription. Think of all the crazy stories I’ll miss, the outfits I’ll never get to wear, the restaurants I’ll never get to try if I call it quits now! And so, for the sake of my morbid interest in cyber chemistry and what makes people click, I’ve thrown myself back into the games of “making connections” with renewed enthusiasm. After enduring more than a few awkward conversations on the subject of my blog with Dates #1-4, I’ve rewritten my match.com profile to inform any and all interesting parties of my ethnographic experiment. As a result, my blog readership doubled (fabulous!) but my “wink” count plummeted (not so fabulous). It would seem that most hot blooded men aren’t too thrilled by the idea of internet exposure and honestly, I can’t blame them (one of my dates signed his most recent email as “# so-and-so” and even though I like to think he was just kidding around, I couldn’t help but wince). In order to compensate for the loss in winking, I decided to reorganize my match.com photo gallery. Where my Facebook profile shot once reigned supreme as my “primary photograph” (the first displayed to potential suitors), I’ve inserted a rather cheeky—and okay, rather leggy—shot of myself waiting at the bus stop in London. And no, I wasn’t on my way to the library that night. I was on my way to play arm candy to a throng of professional footballers at an exclusive nightclub on Oxford Street and I can assure you, I was dressed the part. The result of my new photo? My collection of “winks” has skyrocketed. Evidently the average hot blooded man isn’t so bothered by the blog after all—at least not when it’s written by a leggy girl in high heels. 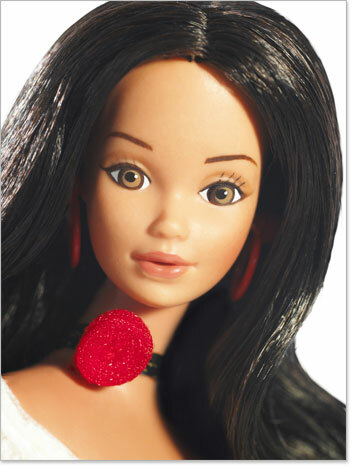 But there’s a catch: now I’ve got middle aged fathers of four asking me to be their Latina Barbie. Seriously? No thank you. I like kids and all but until I reach a level of maturity when I come to value quality over quantity whereas my love life is concerned, I don’t think I’m in a position to play mom (or Latina Barbie) to anyone. The other winkers haven’t been much better. One’s called Vinny.Y.Not. He describes himself as “fun” at several points in his profile. In his first photograph, he’s posing in front of the bathroom mirror with his camera phone. In his second photograph, he’s posing in the very same bathroom sans shirt. In his third photograph, he has his thumb inside the waistband of his boxers and he’s pulling them down, just in case the previous shot didn’t do the trick. I’ve got to give it to Vinny.Y.Not; he has a rather well developed six pack— the kind my old roommate would have squealed about, proclaiming, “You could grate cheese on those abs!”—but here’s why not, Vinny.Y.Not: pull your pants up! Vinny.Y.Not is one of the reasons online dating has such a bad reputation (and one of the reasons I’m tempted to change my primary photograph back to something a bit more demure). Next up is a self described “cultural connoisseur” who has a great sense of humor. I know this because he writes, “I have a great sense of humor. I work in a design firm, LOL!” I’m sorry, did I miss something? What’s so funny about working in a design firm? And if you have to tell people you have a great sense of humor, chances are you don’t. I wade through profile after profile. “Love my Steelers!” is a reoccurring theme. Well, that’s nice. I’m sure they love you too but I don’t really see how this information is helpful. And just in case you were wondering, answering “What was your latest read?” with “Hmmm… I don’t really read,” is not terribly helpful either. So it’s back to the drawing board (unless one of the Second Daters somehow manages to sweep me off my feet before anyone else asks me to be their Latina Barbie).